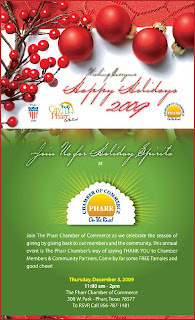 The Pharr Chamber of Commerce celebrates the holidays with their Annual Tamalada this December 3, 2009. The Tamalada will be held from 11 to 2 pm at the Pharr Chamber of Commerce, located at 308 W Park. You can RSVP by calling 956-787-1481. If you are new to the Rio Grande Valley, tamaladas are a traditional gathering where guests join in making and eating tamales. These days, tamaladas mainly consist of eating tamales, which are a favorite during the cooler seasons. On a cold day, tamales and coffee are a treat.